Uva ursi which has the scientific name Arctostaphylos uva ursi is a smallish evergreen shrub native to parts of Europe and the Northern parts of the United States. Although its fruit is edible, it is only the leaves of the shrub that are used to make medicinal supplements. It has long been used as a medicinal herb with evidence of its use dating back to the 2nd Century. Commonly known as bearberry because bears are fond of its fruit, it is documented for the first time in Europe during the middle Ages in a Welsh textbook called ‘The Physicians of Nyddfai’. It appears that the use of Uva ursi was widespread in Northern Europe before eventually making its way down into Central Europe in the 17th Century. On the other side of the world, there is also documented evidence that the Native Americans have used it to treat bladder related infections for centuries. By the 19th Century, Uva ursi was being used widely in Europe for a range of conditions including diabetes, urinary tract infections and gonorrhea. In more modern times, it is only considered popular as a treatment for urinary tract infections, cystitis and as a diuretic. Modern research has discovered that there is good reason for the use of Uva ursi in folk medicine. Uva ursi mainly gets its therapeutic qualities from two chemical compounds – arbutin and hydroquinone. Uva ursi also possesses tannins which give the herb an astringent effect -these tannins help shrink and tighten up the body’s mucous membranes which helps to reduce inflammation and in turn fight infection. The use of Uva ursi to treat infections of the urinary tract dates back a very long time and it continues to be used to this day. Researchers have noted the reason for its effectiveness is that it contains a chemical called hydroquinone and a derivative called arbutin which is the main active substance in the herb. These compounds give Uva ursi the potential to treat a range of urinary tract complaints including cystitis, nephritis and urethitis. When you take Uva ursi supplements, the arbutin gets absorbed by the stomach before being converted into hydroquinone and sugar. This hydroquinone then creates another compound by combining with glucuronic acid. When urine is eliminated from the body, the substance soothes irritation by acting directly on the urinary tract’s mucus membranes. Not only does it ease the process of urination but it also helps fight infection and reduce inflammation. It is worth noting that when taken alone, arbutin does not work as effectively as the full Uva ursi supplements. The reason for this is that bacteria in the intestines break down the arbutin while other compounds found in Uva ursi help prevent this process from occurring. In Germany, the governmental regulatory body – the Commission E – has approved the use of Uva ursi to treat lower urinary tract inflammation. Uva ursi contains natural diuretic compounds like ursolic acid which can help increase the quantity of urine and promote the frequency of urination. Because of this, the herb may help flush out any bacteria from the body. It has also been used to relieve the buildup of uric acid which can lead to painful conditions like gout and to eliminate bladder stones. It is also possible that its diuretic actions can help relived the feelings of bloating experienced by women during menstruation. As a note of caution, if you decide to use uva ursi on a regular basis, you should definitely think about replenishing the potassium which you can lose along with the excess fluid. Be sure that you either take some form of potassium supplement or preferably eat plenty of foods that are rich in potassium. As a natural astringent, Uva ursi might also help strengthen and tighten inflamed or irritated tissue. It contains a compound called allantoin which is considered helpful for its ability to repair and soothe damage to tissues. As an external astringent, it can be applied topically to treat and clean minor scrapes and cuts. The astringent tannins found in uva ursi have also been used to treat diarrhea because of their binding efect. As we have already mentioned, Uva ursi contains a chemical known as allantoin. This can help to relieve tissue damage when applied to cuts and minor wounds to the skin. It is also contained as an ingredient in many antiviral creams used to treat vaginal infections, herpes and cold sores. Because Uva ursi acts as a natural diuretic it promotes urination which can relieve water retention and bloating. This may have certain side benefits in terms of weight loss especially when people are trying to shed additional stubborn water weight. Shedding water weight is not the best measure of healthy weight loss and despite its potential it must be noted that no studies have ever been conducted regarding the effectiveness of Uva ursi as a natural weight loss supplement. Uva ursi is available in both crushed leaf and powdered preparations. Be sure that you speak to your doctor before taking it as it is potentially toxic when taken long term or in large doses. Make sure that you buy your supplements from a reputed supplier and that you are fully conversant with the instructions for use. Do not give Uva ursi supplements to children. The fact that a herbal remedy is natural does not mean that it is safe for use and as with any herb, you should speak to your doctor before starting to take Uva ursi supplements. Uva ursi contains hydroquinone which may be toxic to your liver. Because of this, you should definitely not take Uva ursi for more than five days at the very most. 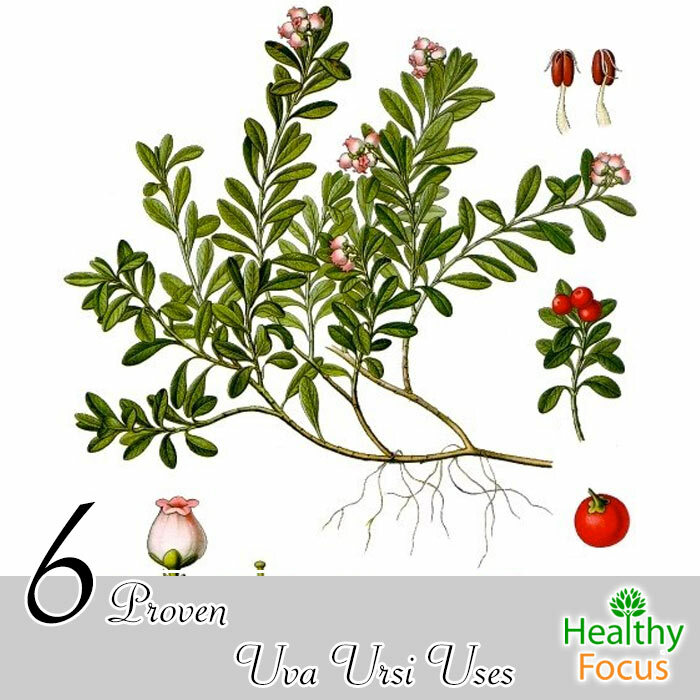 You should also not take doses of Uva ursi in excess of 5 times a year. Reported side effects include nausea, vomiting, irritability, irregular heartbeat and insomnia. Pregnant women should avoid taking Uva ursi supplements as should nursing mothers. Those with pre-existing conditions including high blood pressure, kidney disease or liver disease should avoid taking Uva ursi supplements. People with stomach ulcers, Crohn’s disease and other chronic digestive conditions should avoid it. Uva ursi may interact with the following medications; if you are taking any of the following please be sure to talk to your doctor before taking this herb. NSAIDs and corticosteroids – Studies on animals indicate that Uva ursi might increase the anti-inflammatory effect of these medications.